Autumn is my season. There is nothing I dislike about it. The colours, the smells, the holidays, the promise of cozy nights ahead…. I was courted by my husband during this time of year. I have vivid recollections of that time. Shamelessly in love, sitting next to him on the front seat of his old Chevelle, his hand on my neck. Rain falling on the windshield, a wet leaf clinging on despite the wipers as we drove the back roads. We got married in the fall as well. A small gathering in the country; cold wind and champagne. “You are my autumn”, he said. These words, spoken to me recently on the anniversary of our marriage, mean more to me than my husband can imagine. A stroll across my property is magical. Apples trod upon underfoot send up the sweet and sour aroma of damp earth and decay; little rubies partially-hidden in grass that needs to be cut but was left to grow in expectation of cold weather. Leaves are still falling: golden ochre, reds, pinks and brown are littered across the ground. Piles are made and jumped in and left to scatter in the wind. Dying grasses, thistles, burs and plants breathe new life into the landscape and rustle with the wind. The air is crisp despite the hot sun and blue sky above. I lift my face toward the light, eyes closed, and give thanks. It’s hard to imagine the change in weather on days like today. We are well into October, and while the nights are cold, our days have been sunny and warm. It feels like summer doesn’t want to leave quite yet. And who could blame her? This time of year is spectacular to behold! The change of seasons in the country is always incredible to witness. Subtle at first, and then one day you are startled by the harsh transformation. It’s hard to imagine winter is coming on days like today. I am drawn to the outdoors. Soon, winter will be here and my strolls through the property will become less and less. The geese are busy, flying in loud gatherings overhead. 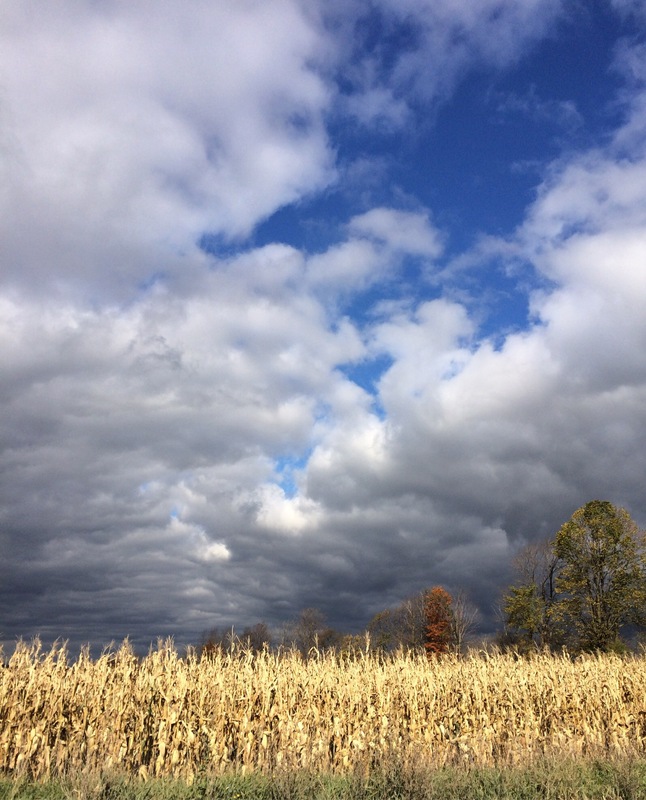 Flocks of little black birds – sometimes in the hundreds – burst out of the long dried corn stalks in beautiful precision. I am saddened by the report of gunshots in the distance, which signals hunting season. We don’t hunt and I always worry about the animals on our property. 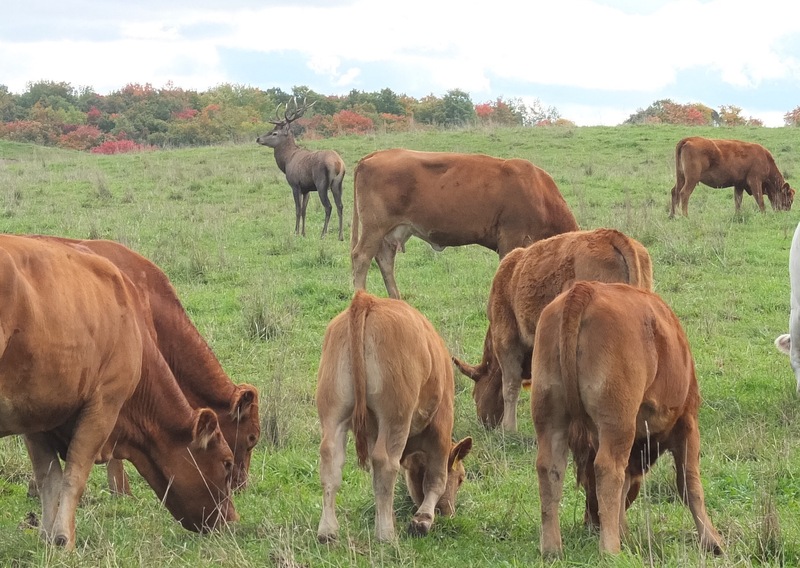 Last year, we saw a beautiful elk bull that had found his way to the neighbour’s field, and spent his days grazing with the cows. He was magnificent. Silver and black, with big antlers. He had managed to make it to full adulthood. Our neighbours watched in fascination until hunting season opened. Then they shot him. I confess, I am anticipating the cold weather. Our winters can be harsh so I face them with mixed emotions. But like most things, I’m inclined to romanticize the season. There are things about winter that I love: that feeling of stepping out of the cold and into a warm house; the sudden relief of warmth on your frozen cheeks. The smell of cooking or baking in my warm kitchen. The flicker of candlelight when the evening comes early. The cozy blankets to snuggle under and big socks to keep your toes warm. The fire in the wood stove flickering bursts of light in the darkness of a quiet house, wood cracking and popping in the silence; kids asleep and cats stretched out in every chair of the living room. Our mornings come early and it’s always dark and freezing when we wake up. I have to stoke the embers in the wood stove and get the fire roaring to chase away the chill. It is a challenge to drag myself out from under the warmth of my duvet and into the cold air. My son will sit in front of the fire and have his breakfast, or on my lap, wrapped in my sweater. I love this. He curls his little body around me, pulling all the heat from me with his cold little fingers. I breathe him in, my face buried in his hair. Weekday mornings are rushed so we can catch the school bus, but there is always time for a quick snuggle. I drink a cup of coffee, letting the hot mug warm my fingers, sometimes even lifting it to the tip of my nose to warm it up. The sun is just beginning to rise by the time we have our winter gear donned and are out the door to catch the bus. There are some mornings we have to trudge through knee-deep snow to get to the top of the lane. Our little bus shelter will keep the biting winds at bay while we wait for the bus that always seems to be late on these bitter cold mornings. Better yet, the buses will be cancelled and we get a snow day! The chickens and turkey are still let out of their pen in the winter, but they don’t stray too far. They will find a patch of sunshine and burrow down under the overhang or outside my living room window on the front porch, looking at me. If the day is dangerously cold, I will let one in. But don’t tell anyone! It’s usually Henrietta, and she goes straight for the cat dish and then sleeps in the basket by the stove. The horses seem impervious to the cold. Their shaggy coats and horse blankets keeping them warm. Today though, winter still feels far off. I am heading out to finish piling the wood that will heat our house for the winter. I’ll enjoy this autumn day. I am autumn, and I am filled with nostalgia.